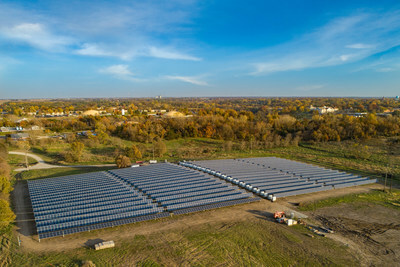 FAIRFIELD, Iowa, Jan. 8, 2019 /PRNewswire/ -- Maharishi University of Management's new solar power plant, designed and installed by Ideal Energy, Inc., powered up for the first time Mid-December. The cutting edge facility incorporates both single-axis tracking and vanadium-flow battery energy storage. Designed by Ideal Energy, Inc., it is the first system of its kind in the Midwest and among the most technologically advanced solar installations in the United States. Special guest Congressman Dave Loebsack said at the energizing ceremony, "One of the more exciting things about this particular project is the battery storage aspect. This is leading us to the point where solar can be part of our base load capacity. If we can not only generate electricity throughout the day, but also store it so that we could use solar energy 24 hours a day, then it is by definition part of base load. And that is really exciting." The 1.1 megawatt NEXTracker NX Horizon single-axis tracking array uses motors and a predictive algorithm to rotate solar panels throughout the day, following the sun's path, generating around 15% more energy annually than a fixed-tilt array of comparable size. NX Horizon is capable of active tracking, which allows each row to operate independently to optimize solar production. The project also includes a 1.05 megawatt-hour battery energy storage system, which works in tandem with solar energy to reduce MUM's energy costs by 'peak shaving' ? drawing power from the solar panels or batteries instead of from the grid during expensive peak times of the day. The power plant uses NX Flow Avalon batteries which have an extraordinarily long service life. These vanadium-flow batteries are ideal for large solar power plants because their capacity and performance does not degrade over time. MUM has long had a strong commitment to sustainability. Achieving a high renewable energy share is an important part of that commitment and a major milestone on the path to a carbon neutral campus. The University's new solar and storage power plant, along with two smaller solar arrays and a small wind turbine, will bring the University's renewable energy share to 43%. It will directly power 1/3 of the campus's electricity usage. By combining active tracking technology with battery energy storage MUM will cut its electric utility costs by a projected 30%. The state-of-the-art solar power plant will also serve as an energy research facility. Ideal Energy, Iowa State University, and MUM will conduct studies on solar production and battery storage with research grant funding provided by the Iowa Economic Development Authority. "We've designed and built other solar plus storage arrays, but this is the most advanced so far," said Troy Van Beek, founder and CEO of Ideal Energy. "It perfectly matches MUM's needs and checks all the boxes ? tracking, battery energy storage, and artificial intelligence." "We believe it will serve as a model for other universities," he added.